The cold winter nights are upon us, and slow cooker soup recipes are on regular rotation here in our household. 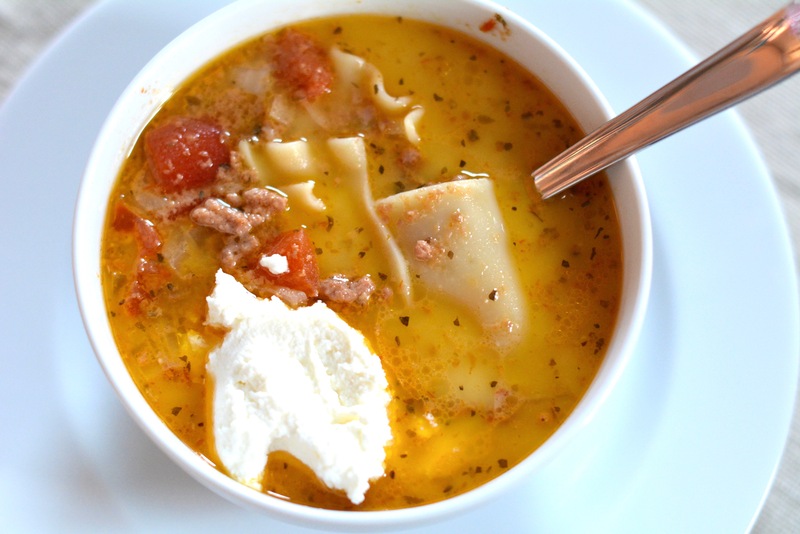 One of my favorites these days is slow cooker lasagna soup. It has all the flavors we love in lasagna, but in soup form. Even better, it can be assembled before you go to work and is ready when you get home. Once you get the hang of this soup, feel free to tweak it however you want. Some more vegetables or a can of lentils would be a terrific addition if you have them on hand. If not, serve this up with crusty bread and a salad, and you’ll be eating a lightened up (but still very hearty) version of lasagna for dinner. Assemble this lightened-up version of lasagna before you head to work and come home to a fully cooked meal. Step 2: Stir in the parmesan cheese and add the noodle pieces and cook for an additional 30 minutes, or until the noodles are cooked through. Divide amongst serving bowls and top each one with a dollop of ricotta cheese. Serve hot!